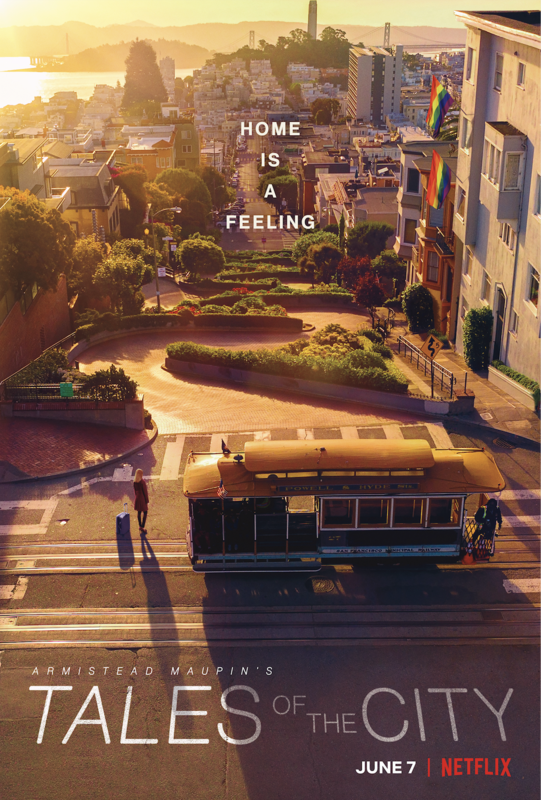 San Francisco looks stunningly beautiful and gloriously kooky and bohemian in the newly released trailer for Armistead Maupin's Tales of the City, the Netflix reboot of the ensemble tale that began with a 40-year-old serial column in the Chronicle, and a PBS miniseries based on those columns nearly 20 years ago. "The house was on Barbary Lane, a narrow, wooded walk-way off Leavenworth between Union and Filbert. It was a well-weathered, three-story structure made of brown shingles. It made Mary Ann think of an old bear with bits of foliage caught in its fur. She liked it instantly." As you may know, the real-life inspiration for Barbary Lane was Macondray Lane, a little pedestrian lane with a staircase that runs between Leavenworth and Taylor, between Union and Green Streets, on Russian Hill. Maupin's column began in the Chronicle in 1976, and he continued writing books about the characters he created long after the column ended. Also returning in the new series with Linney and Olympia Dukakis — as a now 90-year-old Anna Madrigal — is Barbara Garrick, who plays Dede Wilsey stand-in DeDe Halcyon. As SF Weekly described it in 2014, Maupin's column "was able to take a 1970s San Francisco that was the national mecca of sexual liberation and acceptance and depict it in an endearing and humane manner — without misrepresenting or oversimplifying it all." And in the new series, we bring Mary Ann and Anna up to the present day, in modern SF, Salesforce Tower and all. We saw some teaser stills from the series a few weeks ago, and now, here's the full trailer, with Linney and Dukakis in all their glory — as well as Rupaul's Drag Race stars Bob the Drag Queen and Katya, and newcomers to the franchise Ellen Page and Murray Bartlett, who plays Michael "Mouse" Tolliver. Grab a Kleenex. Uber is expected to make its IPO filing public on Thursday, with an expected valuation of $90 billlion to $100 billion. Yes, those are big numbers, and some longtime employees are going to get quite paper-rich very soon. But this panic over all the pending IPOs needs to stop. The just-opened Gram Cafe and Pancakes at the Stonestown Galleria is one of several Asian food businesses drawing crowds to the otherwise faded shopping center — and it's serving an Instagram-trending dish that's kinda sorta sweeping the nation.